Yet at main entrance of Amahoro, the feeling one gets is that of an art and craft dealership, or a cultural artifact center: there are countless paintings on canvass, wood carvings, tribal masks and cultural paraphernalia neatly displayed at every nook and cranny, every wall, tree trunk and stump. Actually, this place has become a melting pot for local artisans either plying their wares to tourists who check into the facility, while others do come here for free apprenticeship.. Prior to this move, Bakunzi had been doing some cultural tourism projects with the Dian Fossey Gorilla Fund, a mountain gorilla conservation project. “I wanted to preserve our local culture, which is why I went in for this particular look, because that is what responsible tourism is all about. 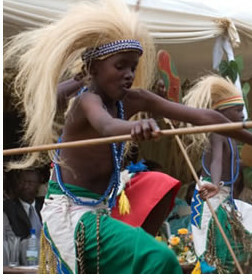 When I first thought of setting up Rwanda Tours, the main mission was to offer cultural tourism, and I could not have kept its office in a different way,” he explained. Seven kilometers out of Musanze town, in Nyakinama village sits the Red Rocks Campsite and Cultural Exchange Center, Bakunzi’s second major project. Essentially a camping facility for backpackers and tourists to and from the gorilla trail, Red Rocks also serves as some kind of demonstration facility for Bakunzi’s “community, conservation and tourism” pet project. Bakunzi’s auxiliary, home-grown tour itinerary seeks to supplement the core packages of gorilla tracking and mountain hiking for which the Musanze tour destination is synonymous. He calls it “cultural tourism”. In a nutshell, what Bakunzi does is to sell real life cultural experiences to tourists, as opposed to tour destinations. He offers a taste of local culture and life experiences to tourists at a fee. This cultural package includes a host of activities in which one can choose to take part; village and community walks, basket weaving sessions, banana beer production, farm harvests, traditional music and dance, family visitations … you name it. Usually, these tourists looking for some kind of trophy to carry back home, the reason they will go out of their way to touch base with authentic local country life. For this, they are only too glad to put away their gorilla permits and five-star Kigali comforts, if only temporarily.